The answer is: all starting points are equally valid. As the borders of our field in music writing grows, one of the things we might try, if we haven't already, is producing a work in song form. There are several variations of this form, but the one most used in the 1st half of the 20th century by respected Tin Pan Alley composers like Irving Berlin and George Gershwin is AABA, where the A sections are choruses and the B section is either a verse or a bridge. It helps to have a short supply of blank musical scores in the home page of our online music writing application ready for the next creative moment. There could come a time, and the wisest knows not how soon, when we just might wake up some day with a brand new, original melody in our head that shows promise for a composition. At these times we need to open our notebook PC as soon as possible and enter it on the top line of a blank score; if it's shape isn't perfect we can always "tweak" it or reject it at some later revision or another, but at least we won't lose it this way. Most of the time however, our music will come to us while we're staring at a blank staff; ideas will come and insights will accrete after we sit down to do our work [See blog, Inspiration, Parts I, II, III]. An example of a work in song form is Lied in B Major, Op. 15 (photo). "Lied" (pronounced "leed") is the German word for "song." When we ascribe a title like this, any title, to our written piece, it should have some connection with its form and what's inside it; it's a disconnect from the get go if the contents of a can and its label don't match. The ear discerns the tune of a song by picking out what's going on in the highest line of the harmony, thus, unless it's a transitional passage, the soprano line is the place for the melody throughout the piece; this is the line the singer will recognize as their part. Organ music, in general, relies upon polyphony for its impact; its glory is determined by the counterpoint written into it, where all the parts have equal rights. And this is true is so much music, not just organ music. In a song however the tune typically doesn't lend itself well to the "learned" (pronounced as 2 syllables, "ler-ned") devices (inversion, retrograde, inverted retrograde, augmentation, diminution, sequencing, segmentation, canonic imitation, ornamentation, etc.) that are often employed for developing a polyphonic composition. Instead the tune stands alone, unadorned in its simplicity, supreme in the top line, where its development demands a strongly rhythmic homophonic treatment in the accompaniment where all the other parts are strictly subordinate to the tune. As soon as a single countermelody is juxtaposed with the song tune, we have counterpoint; think of the piccolo part in the Stars And Stripes Forever March by John Phillip Sousa; the glory of this work is the crowning countermelody written for the piccolos which soars high above the brass in the last half of the piece. We can further enrich the harmony of a song by adding an alto voice to the top staff, but the tune ought to always be above the rest of the harmony so that, if we wanted to, lyrics could be added and the top line could be sung. And that top line, in a song, should be singable; it should be remembered that instrumentalists can play faster than a vocalist can sing; we therefore can't write a song line with the same freedom we would use in writing a part for an instrumentalist. The tune therefore should move preferably by step or short leaps only by consonant intervals, proceed at a moderate tempo, and be memorable. Brief rests can be written into the score between the phrases of the tune with advantage to set them apart and give any potential singer performing it a split of a second to take a breath. In Lied in B Major Op. 15 the song tune begins in the the home key in the top line and is 16 bars long, evenly divided into 4 phrases of equal length; a color reed would work well here to bring out this line. This is then harmonized voice by voice in 4 parts; soft Dulciana or Gamba tone would work well for the left hand parts with soft 16-8 foot covered flute tone drawn in the Pedal. This A section of 16 bars is then repeated in an unrelated key (G Major) without an intervening modulation; since the tune begins on the 3rd scale degree and ends on the 1st scale degree, it was decided to begin the restatement of the tune using the final note of the song tune as its first note when it reenters. The song is then repeated in trio texture with a slight quickening of tempo; here a flute color appears in the right hand and the color reed switches to the left hand line. Principal (diapason) tone, if not too assertive, might also be chosen for the right hand part here, if its sound is right; the ear will guide the performer on this; the idea is just to make it different so the sound isn't the same, over and over. The B or bridge section which follows consists of nothing more than a short transitional passage of 4 bars in which the tempo slows down, the harmony evaporates, and the tenor and bass voices take turns reiterating the first few notes of the tune inverted, one at a time; this passage, stunted in length, functions merely to bring about a return to the home key. 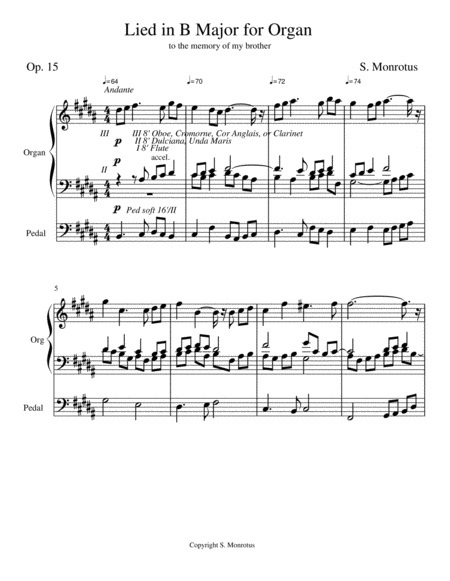 This work is a cradle song dedicated to the memory of the composer's older brother who was born with a condition which took his life as an infant at the age of 6 months; this B section, reduced to a single line with its sad, reflective tone almost haunting in its simplicity, is an attempt to depict the realization of this in musical terms. With the return of the A section the tune is harmonized in 4 parts voice by voice employing imitation at the interval of a 3rd between the outer voices; imitation like this can occur at any interval from the unison up through and including 2nds, 3rds, 4ths, 5ths, 6ths, 7ths, and the octave. In previous postings [See blog, Prism, Getting Started With Writing, Parts II, VI, VII] the suggestion was made to take the thematic material and shine it through it through the prism of one's own life's experiences and let this symbolism give it a shape; this is another device intended to depict a little life which came to a premature end before it even had a chance to unfold. This work ends very slowly, very quietly, very peacefully, with a short coda employing a penultimate tonic chord chromatically altered with a sharpened and flatted 5th 2 octaves apart before resolving in 5 voices in the radiant home key of B Major. When we're composing or improvising it helps to conjure up images like this from our own or someone else's experience. If can put power into our writing.